Back when I was in school in England, the benchmark of completing secondary education was taking the external examinations known as the General Certificate of Education, Ordinary Level (GCE O’level) and /or the Certificate of Secondary Education. (CSE). By the time I was in Form V (11th year of secondary school), my classmates and I were deep in preparation for the GCE O’levels and CSE examinations. Our boarding school, Charters Towers School (CTS), in the sleepy beach town of Bexhill-on-Sea, Sussex, followed the University of Cambridge GCE O’level curriculum, implying that we were preparing for tougher exams. All I remember is being sick with a serious case of laryngitis and having to suppress excruciatingly painful coughs induced by the illness so as to not disturb the other girls furtively scribbling their answers on the exam papers. The fact that I managed to score well on the exams given my poor state of health is a wonder I can’t explain to this day. I left CTS and the UK after finishing the first term of Form VI after being accepted to university in the U.S. Much has changed in the UK education system since then, especially with the GCEs and CSEs which were combined into the GCSEs. And there’s still talk about revamping the secondary and Form VI curriculum and even extending school leaving age to 18. Unlike the United States, where every course taken with credit and final grade earned counts toward ones overall grade point average qualifying for the award of the Bachelor’s degree, students at UK universities did not face the same assessment methodology, at least until now. Debate is currently underway in the UK as to whether the 1st year of university studies should be counted toward the degree and in so doing to adopt a grading system similar to the grade point system of the U.S. This would mean doing away with the traditional degree classification model (First Class, Second Class, Third Class, Pass, etc.). It’s not just the GCSEs that are about to get a makeover, the GCE Advanced Level examinations have also been under scrutiny. The Department of Education has accepted to allow the universities to have more of a say in the redesigning of the A’level curriculum, though some feel this involvement will make the A’levels look nothing but a university entrance examination. (Currently, the A’level examination content is developed by the examination boards and the Department of Education.) As a result, the A-level Content Advisory Body (Alcab) has been formed to co-ordinate input and advice from specialists and university experts. Alcab’s role is ensure the A’levels in mathematics, advanced mathematics, English literature, physics, biology, chemistry, geography, history and modern and classical languages offer students “adequate preparation” for higher education admission. Universities don’t feel the students entering their institutions with current A’level examinations have sufficient preparation to tackle undergraduate coursework, especially in writing and research skills. Universities in the UK are competing for #1 ranking in sustainability. Manchester Metropolitan University grabbed this year’s “People and Planet Green Leagu” #1 spot followed by Plymouth University in 2nd place and Greenwich (last year’s #1) in 3rd. Both Cambridge and Oxford ranked abysmally this year, even worse than last year. Cambridge dropped 17 places and is now ranked at 113 out of 143. Oxford didn’t fare well either. Institutions are judged on their strong sustainability programs, from food to design, carbon-reduction efforts, ethical investments, staff resources, and environmental management, to name a few. The Guardian pushes the “university league table” that charts the rankings of universities in the U.K. and earlier this month, the institution that suffered the most with the poorest ranking was the University of Sussex. According to the table, Sussex dropped from 27th place to 50th, “its lowest ever position since the table’s establishment.” Some of the reasons attributed to the University’s dip in the rankings are: poor employment rates (perhaps caused by conflict between students and management over plans to outsource campus services) and students concerns over assessment and feedback. Sussex pro-vice chancellor Clare Mackie explains the drop a mere “blip” in the data, when graduate unemployment rates reached double figures for the first time and that students have now been addressed. 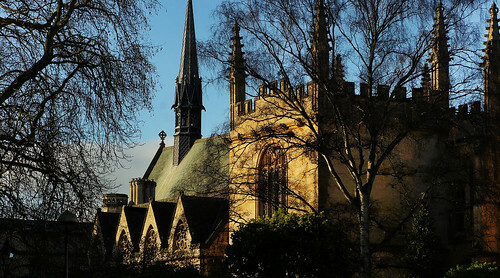 After his application for admission was denied for not having access to £21,000 for tuition fees and living costs, Damien Shannon, a 26-year old student, sued St. Hugh’s College, Oxford for “selecting by wealth.” In his suit, Shannon claimed that since its founding in 1886, the college was discriminating against the poor by asking “students to prove that they had liquid assets sufficient to cover £12,900 a year in living costs, in addition to potentially tens of thousands of pounds in tuition fees. Under the university-wide policy the college refused to take into account projected earnings from students who planned to do paid work during their course.” Shannon has met the University’s academic requirements for admission but not its financial criteria. St Hugh’s has filed a defense and refutes the claim arguing “that the test of a student’s financial health is to ensure that they will be able to complete their courses without suffering financial difficulty and anxiety, according to its lawyers’ defense papers.” Friends of Shannaon and even a cabinet member of parliament Hazel Blears (a former Labour cabinet minister who is now chairwoman of the all-party parliamentary group on social mobility), see Oxford University’s criteria for a guarantee on living expenses by students who have met the academic requirements, as deeply unfair. According to Blears: “It is ludicrous that a student deemed to be of sufficient academic merit is deemed incapable of budgeting to ensure they have enough money to live on. Even in an expensive city like Oxford, a student can live on far less than £13,000 a year with careful budgeting. In any case, living costs should be a student’s personal responsibility and many get part-time jobs to help make ends meet. generating economic resource contributing an estimated £8bn to the UK economy every year by paying high fees to universities and colleges and making a valuable contribution to local economies. As universities faced drastic funding cuts, they were relying on growth in the international student market as a financial reprise, but the decline in the number of students looking at the UK to further their education has hurt universities financially. The immigration crackdown and focus on students has much to do on abuse of the visa system, “bogus-colleges,” and students arriving in the UK with no intention of studying. However, the crackdown also means that those students who genuinely are intent on getting an education are being barred from entering or choose not to apply to universities in the UK and instead turn their attention to Australia, Canada and the U.S.
Across the pond, concern over international education agents and their commission-based recruiting of students is a subject of discussion as it is here in the U.S. More and more UK institutions are relying on international education agents to recruit students from them by paying the agents commissions. The University of Nottingham paid £1m in commission to education agents for successfully recruiting international students in 2012. In fact, nearly 58% of international students in the UK and Australia were recruited through agents. There is little transparency over whether agents are used in the first place and how much commission universities pay agents for each recruited student. Transparency, ethical and best practices, and a voluntary quality control program abided by international education agents are steps discussed by educators in the UK to protect the international students, their families and the institutions against fraud and misrepresentation in the marketplace. According to official data reported by Les Ebdon, the access ombudsman for higher education in England, universities and colleges must do what they can to attract students from disadvantaged backgrounds as affluent applicants outnumber those from deprived areas by three to one. (See item #7, which gives Damien Shannon’s suit against Oxford University a heads up.